For a fitness program to work, it has to be convenient, satisfying, and designed with you in mind, your health, your likes and dislikes, your goals, and your style of life. 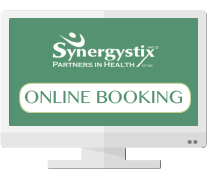 Synergystix, with its team of health care professionals under one roof, can help you achieve optimal fitness. Our highly qualified Certified Personal Trainer and Fitness Consultant, Nancy Phillips-Smyth, has over ten years of local expertise in designing individual fitness programs that work for you and the way you live. A non-threatening, well-equipped gym, conveniently located at the corner of Charlotte Street and Rubidge Street. We are a 1 minute walk from municipal parking. Our fitness programs consider your individual health goals and limitations. Perhaps you want to increase muscular strength or flexibility. Maybe you hope to improve your bone density or cardiovascular capacity. Or possibly you want to accomplish more, avoid injuries, stay healthy, and live a longer more productive life. 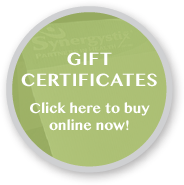 Whether you are an athlete preparing for your sport or just someone who wants to feel stronger and healthier, Synergystix can design a program for you.